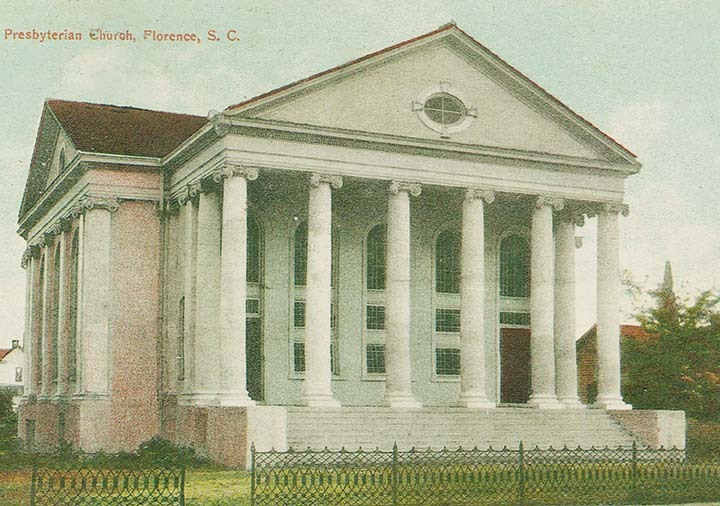 The First Presbyterian Church of Florence, South Carolina, was officially organized on March 23, 1861. Dr. Thomas R. English served the Florence Church as its first pastor with 34 members, 21 white and 13 black. The Harmony Presbytery had decided the small town of Florence was a favorable location for this new church because it was halfway between Darlington and Hopewell. 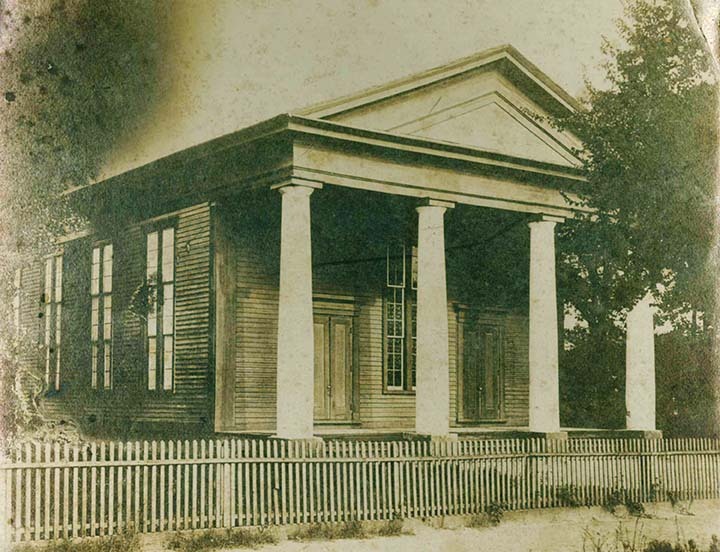 The first building was dedicated to the glory of God in December of 1860 and was located near the railroad passenger station on Church Street. After a period of growth the church moved in 1905 to a second location on East Evans Street between Dargan and Church streets. Between 1905 and 1953, the church grew and participated in the organization of three other Presbyterian churches in the area. Then again in 1953 the church decided to move out of town to the “kite flying field” on Cherokee. The current sanctuary was completed late in the winter of 1959 and the congregation moved in and held the first service in the Park Avenue sanctuary on Easter Sunday, March 29. 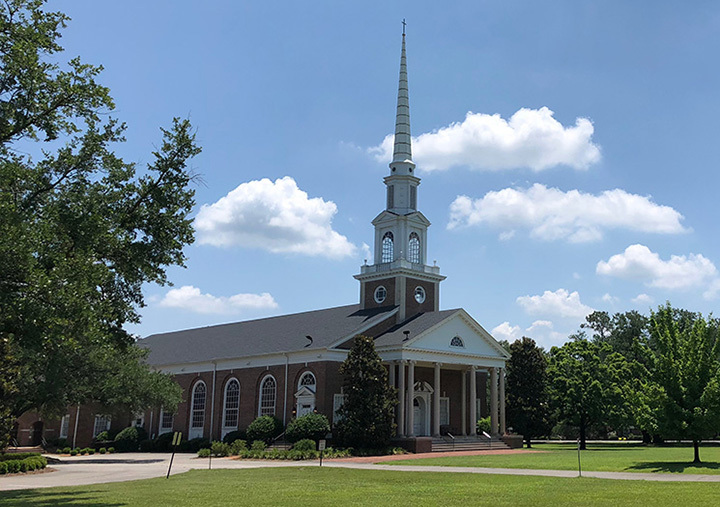 In the mid-1970s, the church experienced a significant renewal that impacted much of the Florence community as well as many Presbyterian churches around the country. Key lay leaders led spiritual renewal events, where many came to the Lord or rededicated their lives to Christ. Many in our church today speak of how God used those days in their own lives. First Presbyterian Church has been and continues to be a congregation committed to mission, sending approximately 21% of its budget to works that promote the Lordship of Christ locally and abroad. Many of our covenant partners have been personally involved in the creation and ongoing support of local mission efforts such as the Mercy Medicine, Lighthouse Ministries, Manna House and the House of Hope. Additionally, our covenant partners have been involved in international mission efforts in places such as Peru, Haiti, India, Mexico, Jamaica, and Ghana. The church also supports over 25 missionaries and missions around the world. The church has a passion to care for its membership as evidenced by a strong ministry to children, youth and senior adults. Many of our covenant partners are actively involved in the church’s vibrant small group ministry. Care for our covenant partners is also evident in our varied and generous support of the Presbyterian Community (where many of our members reside), Keenager ministry (for our retired folk) and men’s and women’s ministries. First Presbyterian would like to have you as a part of our church family. A dozen pastors since its inception, many other support staff as well as hundreds of lay people have made this congregation a place in which to grow upward in our relationship to God, grow inward in fellowship with other covenant partners and grow outward by sharing the good news of our Lord Jesus Christ in our community and throughout the world. Please prayerfully consider joining us.